Below, you will find answers to commonly-asked questions about our sport fishing charter service. What are we fishing for and how? 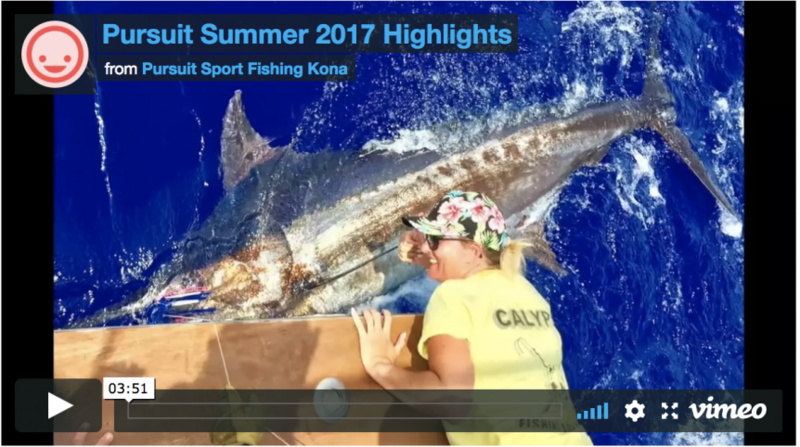 Kona has been a world-renowned blue marlin hotspot since the 1940s with most of the world records and the biggest marlin in the world being caught here. We also catch yellowfin tuna, striped marlin, Shortnose spearfish, Mahi Mahi, and Ono (wahoo). The typical and most productive method is trolling handmade Hawaiian style lures on which all species are a possibility. Live bait is another option, if we find the right conditions. At Pursuit Sport Fishing we supply a light breakfast, lunch, snacks and drinks (water, juices, soft drinks) on full-day trips and light breakfast and snacks on half days. It is always customary to tip the crew. If you want anything specific, please ask in advance and if you want beer, alcohol, etc., please bring these items with you. Be sure to bring sunscreen, sunglasses, suitable boat shoes (non-marking soles), hats and any specific snacks or drinks – we will handle the rest. We usually leave the dock by 6:30 a.m. and return around 4:00 p.m. on full-day trips (9+ hours). Half-day trips will be 4-5 hours and 3/4 days will be 6-7 hours. Time on the water for offshore fishing is key for us to find fish so full-day trips are recommended as we get to fish both tide changes during the day. Also, departure and return times can be changed to meet your needs. Yes. 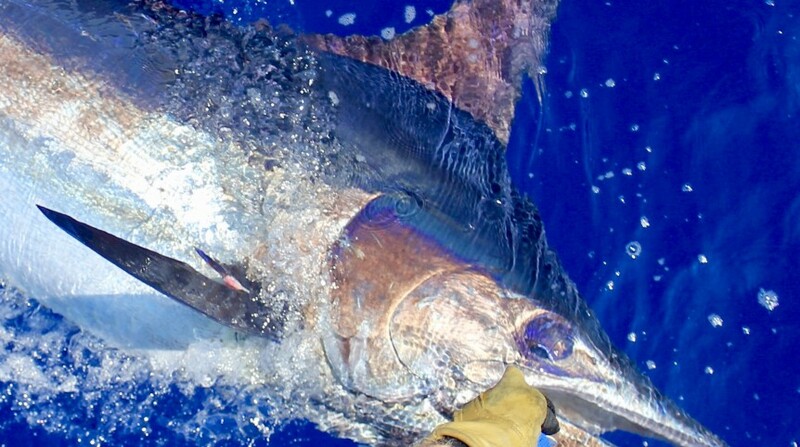 We promote tag and release of the blue marlin but every other species we usually keep as they are great for eating and we will fillet and supply you with what ever you catch as long as you can use it during your stay as we hate waste of fish and live off of eating/selling them ourselves. We are licensed to take 6 passengers which is fine but most of our trips are 2-4 people which is more comfortable with a better chance to find fish for those who want to participate. 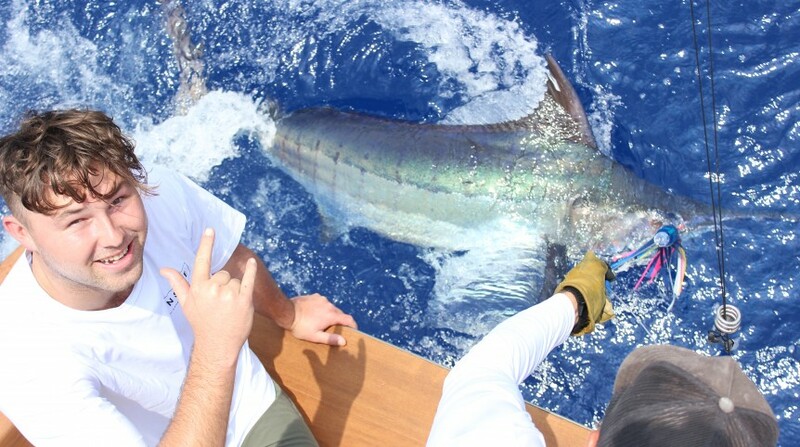 Kona is one of the most special offshore fisheries there is is as world class fish are caught just a mile from the harbor and our water is typically calm 300 days a year. We have about 60 miles of coastline that we fish throughout the year depending on what’s going on. We typically fish 2-5 miles from shore but move up and down the coast accordingly. While most days we don’t need to fish far from home the Pursuit has the speed to go where the fish are if needed. “Whenever you can!” is what I usually tell people. We catch fish here in Kona year ’round. 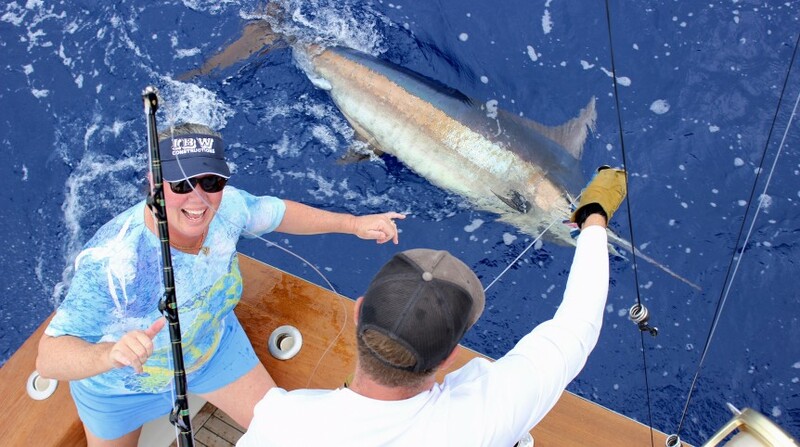 This is the only place in the world where there has been a grander-size marlin caught in every month of the year. June through September are probably the most consistent times. March, April and May boast some of the biggest ones; though, the fish can show up any time of the year.